Made anew each year by a crack team of architects, engineers and ice sculptors, the Icehotel in Sweden Lapland was the first of its kind. Located about 1500 kilometres north of Stockholm in the tiny village of Jukkajärvi, the entire structure is made in winter using snow and ice from the nearby Torne River. Entire bedrooms including fixtures and décor, a bar with full glassware, and even a chapel popular with young couples are made entirely of frozen water. As far as romance goes, there are few hotels in the world that can rival this masterpiece. 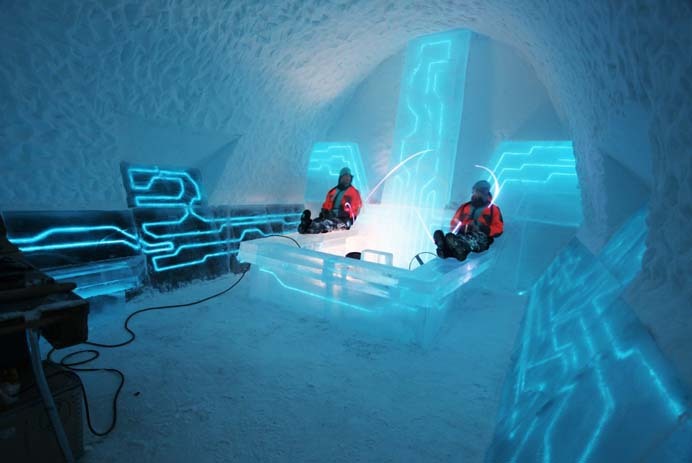 But the attraction of the Icehotel doesn’t lie solely in sleeping in a giant ice sculpture. Jukkajärvi is over 200km inside the Arctic Circle and the uninterrupted natural beauty of this place is just as much a draw card as the hotel itself. Whether it be watching the Aurora Borealis from a mountain top, cuddling up with reindeer or sipping hot cocoa by the fire, there are a number of reasons to stay at Sweden’s Icehotel. A select few expensive tour operators offer direct flights from European cities to Jukkajärvi. These are expensive but for those willing to splurge they provide a mind-boggling view of this tiny village and the rugged Arctic landscape surrounding it. The far more frequented journey is to fly into the capital, Stockholm and take a train or bus into the north. The scenery is spectacular along this route but it is a long ride. Another option is to fly into the popular tourist destination of Kiruna, Sweden’s northern most town. From here it is just a 30 minute bus ride to Jukkajärvi. The main hall in the lobby of Sweden’s Icehotel. Photo by Fredo, Flickr. There is no debating that the Icehotel in Sweden is one of the coldest places on Earth and staying in a room made completely of ice doesn’t suit everyone’s idea of a holiday getaway. The management has recognised that issue however, making every effort to ensure the comfort of potential visitors. A conventional hotel complex next door to the Icehotel has heated rooms and a common area, plus a sauna to relax in. Bedtime is where you venture into the massive ice structure to find your room with thick walls, floor and ceiling made completely of ice. Room temperature is -5C but the polar tested cocoon of a sleeping bag makes you impervious. Once inside you can marvel at the work of art that is your room. Each is completely unique and all the fixtures and décor are sculpted from ice, even down to the artwork. It might feel like a freezer, but it’s actually a stunning feat of human ingenuity. 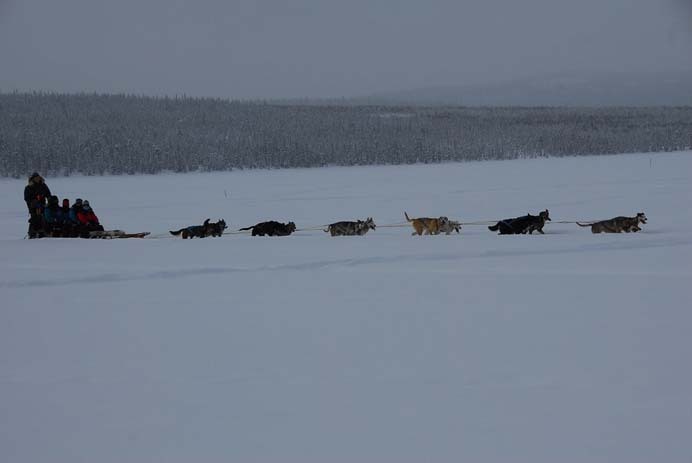 Take advantage of the natural scenery by taking a dogsled through the woods. Photo by Gerard McGovern, Flickr. Remember that this is just about as close you can be to the North Pole and still be in some kind of civilisation. This is the Arctic Circle and though it is a harsh and unforgiving place, it is also home to some of the world’s most remarkable wildlife and gorgeous landscapes. During the winter months a short snowmobile ride up the nearby mountain gives you the unique opportunity to see the green, blue and red swirls in the night sky that we call Aurora Borealis. If this isn’t to your fancy take a dog sled trip through ancient forests of fir trees, try your hand at ice skating or fishing on frozen lakes or ski some of the most isolated powder in the world. Lights in a room at the Ice Hotel. Photo via My Modern Met. The Icehotel undoubtedly brings most of the visitors to Jukkajärvi during the months it is open but this tiny village has more to offer than just the hotel. The land here is frequently home to the nomadic Sami people who roam from Sweden all the way to Russia tending their reindeer herds. Many have set up tourist operations in the village enabling visitors the chance to get a close look at these magical creatures. The rustic Sami church dates back to 1608 and is a great example of Scandinavian architecture. During the warmer months when the Icehotel is not in operation the Absolut Ice Bar opens in town. Walk down the aisle of the Ice Hotel church. Photo via carrier.co.uk. About 100km further north of Jukkajärvi is the Abisko national park, which has the clearest skies in Sweden. It’s bitingly cold but if you want a clear view of the Northern Lights this is the best place in the world to see it. Spend the evening at the Aurora Sky station on top of Nuolja Mountain and watch the sky light up with a light show of cosmic proportions.